I remember the first BIOFLAVOUR conference in 2015 as one of the most useful market-specific biotech events I have ever attended. I was not disappointed with the 2018 event which was held on 18th – 21st September 2018 in Frankfurt. A perfect balance of academia vs industry, presentation vs discussion, enzymes vs strains. It was clear to see significant industrial progress as biotechnology has continued to develop over the past 3 years. Pathway engineering for small molecule production from yeast and bacteria was omnipresent. 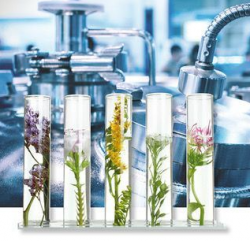 Strain engineering continues to result in new flavour and fragrance products, including Firmenich SA’s AMBROX® manufactured using a White Biotechnology fermentation process coupled with proprietary green chemistry technology. Exciting advancements in sensory analysis were described eloquently by speakers from University of GRAZ, BRAIN AG and Diana Pet Food (Symrise AG). Impressive innovations in novel enzyme discovery and development was another key topic yielding some potentially valuable chemistries such as terpenes, terpenoids, green aldehydes and flavourful peptides; increasingly efficient and cost-effective protocols for metagenomic enzyme discovery and protein engineering are clearly yielding some great new enzymes in the bioflavours industry. Jens Schrader and the organising committee delivered another fantastic event, we now look forward to the next BIOFLAVOUR conference!